Hippozino Casino: NEW Welcome Bonus up to £/€950 and Bonus Spins! A NEW Welcome Bonus from Hippozino worth up to £/€950 and 95 Bonus Spins is available! Hippozino is a heavyweight of a casino and the bonuses and promotions just keep on coming! Don’t be fooled by the zany name, this casino site is pretty slick. Founded in 2012 and powered by industry leaders MicroGaming they offer a superb and extremely professional gaming experience. Featuring all the top MicroGaming slots including Battlestar Galactica, Immortal Romance and Avalon II plus huge progressive slots like The Dark Knight and Mega Moolah. It’s a slot lover’s dream! Enter the casino lobby and you’ll be greeted by all the latest video slots and promotions on offer at Hippozino. The toolbar will help you navigate to the relevant gaming sections and shortcuts to their live support. Scroll down a little and you’ll be able to further drill down into the gaming categories. Choose from casino games, slot games, scratch cards, jackpot games, live dealer and mobile games. 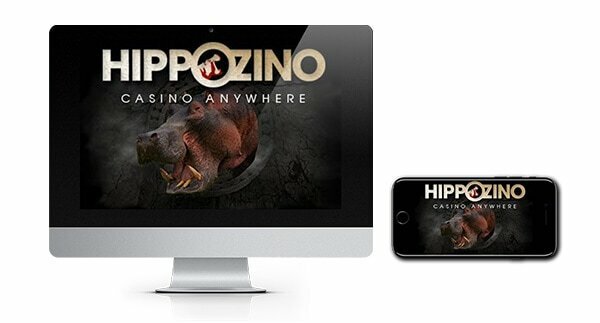 Hippozino Casino are licensed by the governments of UK and Malta and take the security of their players seriously with SSL encryption technology in use throughout the site. With dedicated mobile games, VIP club, excellent customer service, big bonuses and top slot titles they’ve got online gaming well and truly covered! We just can’t get enough of Hippozino slots, there’s something to suit every taste, mood and budget. Enter the world of the undead in vamp themed Immortal Romance or enjoy the new Microgaming hit Bridesmaids based on the box office smash. Other top games featured include Hot as Hades, Game of Thrones, Hitman, Hell Boy, Avalon II, Ariana, Big Kahuna, Judge Dredd and Thunderstruck II. Featured jackpot slots include Mega Moolah, King Cashalot, Cashapillar and Tunzamunni amongst others. It’s not all about slots though as they offer up a wealth of table games too in the form of Roulette, Craps, Baccarat and numerous types of Blackjack and Poker games. Live dealer games include blackjack, roulette and baccarat. If you’re a fan of scratch cards there’s heaps of wacky titles. Try your luck at Foamy Fortunes, Golden Ghouls, Bunny Boiler, Beer Fest or our personal favourite Whack a Jackpot…endless fun! Hippozino provide payout reports for all of their featured games which not all casinos do. Expect plenty of themed promotions at Hippozino including chances to win free spins and cash prizes. Some of our current favourites include Monday Madness where you can double your deposit every Monday and Spin the Slots where you can collect 20 free spins on top of any prizes you may have already won whilst playing your favourite slots! Their Big Cash Weekend Race is heaps of fun too, just play on any game during the weekend and be one of the first 3 players to win £100! It could be well worth your while! At Hippozino you’ll be able to deposit cash into your casino account using credit and debit cards including Visa, MasterCard and Maestro as well as Neteller, Skrill, iDEAL and Paysafe Card. Withdrawals can be made using many of the same methods and will be processed within 3 business days. During the processing time you’ll be able to cancel your request which will place funds back in to your casino account. We understand how important it is to know that you’re playing in a fair and secure environment and that’s true of Hippozino. Licensed in the UK by the UK Gambling Commission and Malta under the LGA they are subject to some of the most stringent online gaming regulations. You can be confident you are protected whilst playing here. Support is available seven days a week between the hours of 6am and 11pm GMT. Type your query into their contact form and someone will respond typically within a couple of hours. If you want immediate answers they offer a live chat service which you can access via their ‘Contact Us’ section. Under their ‘Help and Support’ tab you’ll find some useful information about setting up your account and depositing and withdrawing cash so you may want to take a look there first. Hippozino is one of the leading Netent and Microgaming online casinos, offering a hard to beat line up of casino favourites with many varieties to choose from. Take a look for yourself and enjoy the fun with NEW Welcome Bonus!